We love knowing the best of the best in our state of Texas. Presented by the Texas Cultural Trust, the 2015 Texas Medal of Arts Awards honorees were nominated this recently and spotlight the philanthropy and artistry of Texans and Texas-tied VIPs. The awards recognize an array of talents ranging from music, film, dance, visual arts, corporate and individual arts patronage, multi-media, television, architecture, theatre, arts education, literary arts, to lifetime achievement. During this year’s awards the creativity and generosity of the 83 nominees for 2015 showcase the ability that the arts have to incite education in schools as well as invigorate the Texas economy and culture, all key aspects to our society. Who was an honoree for this esteemed award, you ask? Drum roll, please. 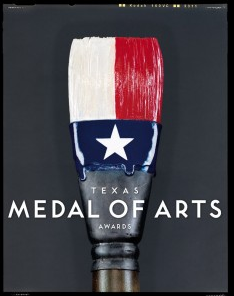 The 2015 Texas Medal of Arts Awards Honorees include: Music: T Bone Burnett, Fort Worth, TX, Film: Jamie Foxx, Terrell, TX, Dance: Kilgore Rangerettes, Kilgore, TX, Visual Arts: Rick Lowe, Houston, TX, Corporate Arts Patron: Dr Pepper Snapple Group, Plano, TX, Individual Arts Patron: Margaret McDermott, Dallas, TX, Multi-Media: Emilio Nicolas, San Antonio, TX, Television:Dan Rather, Wharton, TX; Chandra Wilson, Houston, TX, Architecture:Charles Renfro, Houston, TX, Theatre: Robert Schenkkan, Austin, TX, Arts Education: Booker T. Washington High School for the Performing and Visual Arts,Dallas, TX, Literary Arts: Lawrence Wright, Austin, TX, Standing Ovation Award: Ruth Altshuler, Dallas, TX, Lifetime Achievement Award:The Gatlin Brothers, Seminole, TX. The organization is led by Jennifer Ransom Rice, its executive director, and chairing the event are Gene Jones and Charlotte Anderson.